Luang Phor Sod was born in 10 October 1885 (BE 2428) in Suphanburi province. Being the eldest son with 5 siblings, a very hardworking and filial son who took care of his mother for 19 years. When he was young, he makes his living by selling rice and has been robbed many times on his way travel frequently from Suphanburi to Bangkok. 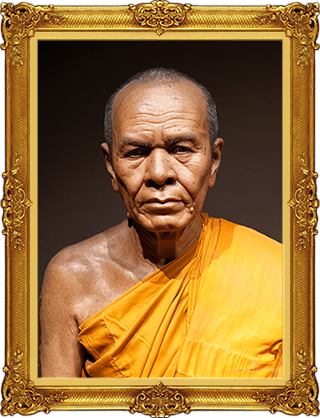 Luang Phor Sod ordained as a Monk at the age of 20. He has determines that he will passed as a practising monk, practicing the path to enlightenment taught by the Buddha. Being the Abbot of Wat Paknam, he was a very sincere benefactor whom supports Dhamma and Sanghas in every possible way. His name is popularly called as Ven. Luang Phor Wat Paknam. He retrieved the extinct Wicha Dhammagaya and refreshed it to become widely known in Thailand and overseas. Luang Phor Sod was a disciple of Luang Phor Niam of Wat Noi. Luang Phor Sod attained Wicha Dhammagaya in 1916 (BE 2459) and since then was teaching the knowledge of Dhamma. Wicha Dhammagaya is a very supernatural Dhamma, with his intermediate level practise he could bring defenses of miracles, such as creating weather rituals in the area at wish, healing sickness that the modern physician unable to cure, finding hidden or lost objects, precognition the future or back to the past beyond your fate, destiny, karma and much more. It is so miraculous that has the abilities’ to defect all kinds of black magic, with those who have been cursed by black magic will be removed by Wicha Dhammagaya. He started creating amulets in 1950 for all donors who helped and supported building the large Dhamma school. He passed away in 1959 (BE 2502) at the age of 75. A totally dedicated practitioner of Vipassana Kammatthana (Buddhist insight meditation). He had contributed greatly to advancing Buddhism throughout his life.